The long-awaited follow-up to The Witcher 3 is a radically different beast. America lies in pieces. Megacorporations dominate what remains, and gangs rule the streets. Welcome to Cyberpunk 2077. CD Projekt Red’s long-awaited follow-up to The Witcher 3 is another fanatically detailed game world that pushes the boundaries of player choice and emergent narrative. 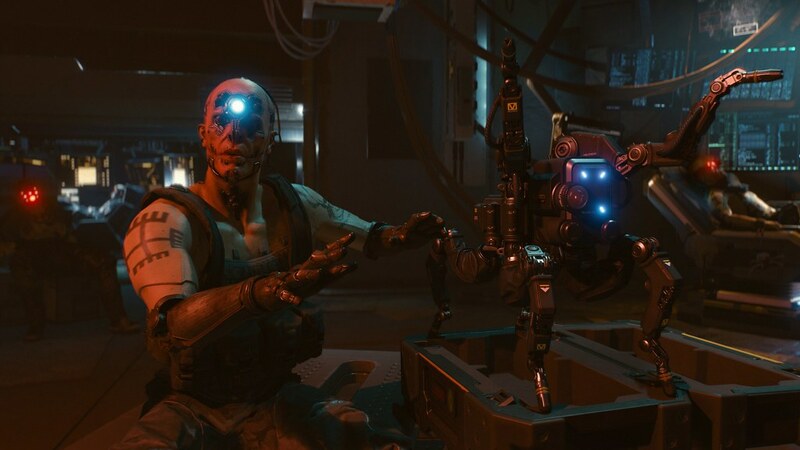 But leave your expectations at the door – Cyberpunk 2077 is a radically different beast, as I quickly learned while watching an overwhelming 50-minute live demo. For starters, it’s set in first-person and emphasizes gunplay. The RPG element remains strongly represented, something you’ll notice from the start of the game as you customize your character’s gender, appearance, and key backstory details that will impact the larger storyline. You play as V, an urban mercenary who executes the dirty work nobody else will do. But the real star here is Night City, a sprawling supercity where high-end cybermodifications represent the height of consumer capitalism, and citizens include body-snatching scavengers, corporate thugs, and augmented posthumans. 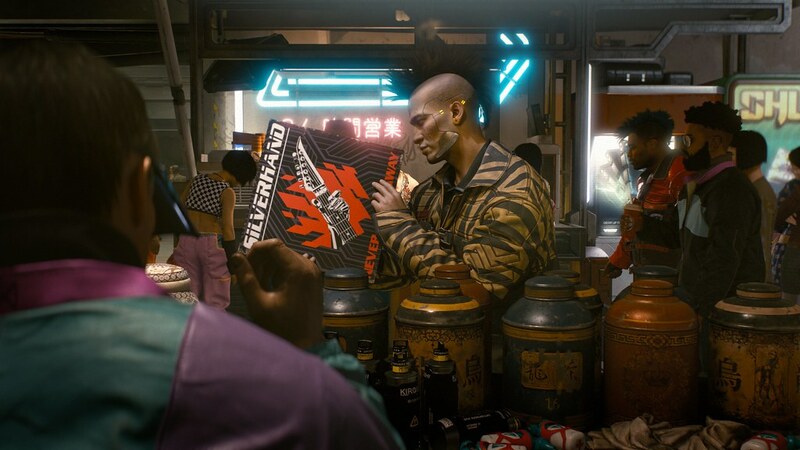 In every sequence I saw, Cyberpunk 2077’s Night City radiated grimy, lived-in authenticity. The game’s alternate timeline means advanced gadgetry coexists with anachronistic technology like newspapers and telephones. Whether you’re creeping through a bombed-out squatter’s den, prowling the freeway in a souped-up car, or infiltrating a shadowy gang lair, the game’s vision shines in vibrant detail. It’s like Blade Runner meets Altered Carbon meets Mad Max. The game takes great pains to make players feel grounded in Night City. Take V’s apartment, which you can visit between missions to spend your ill-gotten gains, select weapons and gear, and equip armor. 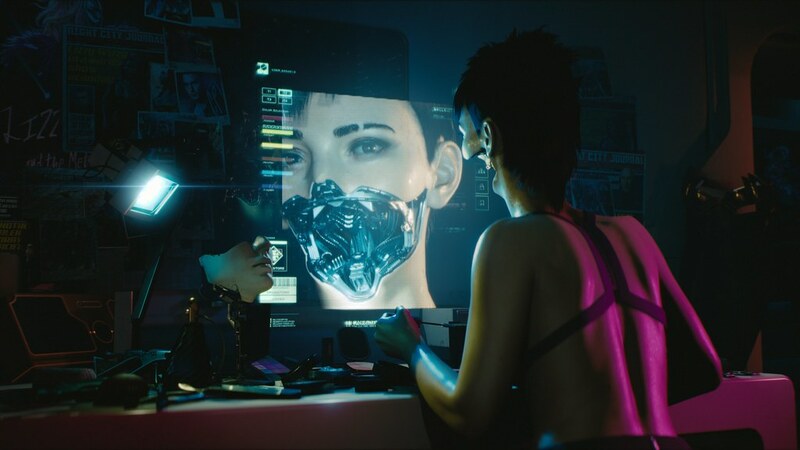 A fun touch: in the world of Cyberpunk 2077, style is just as important as raw combat stats, so donning a cool outfit can grant you unique benefits and boost your street cred. Like The Witcher 3, conversation remains a major component of character interactions, but here a streamlined interface clarifies the flow. While talking, you can drive the story forward quickly, or linger on questions to learn more about the game’s universe. As the demo continued, I found myself comparing Cyberpunk 2077 less with The Witcher 3, and more with the first Deus Ex. That’s a big compliment: Deus Ex is still a cutting-edge RPG, with its emphasis on true role playing and player empowerment. CD Projekt Red promises “hundreds of different weapons” in the final game, bolstered by a deep customization system. I got a look at an enemy-tracking smart rifle, forearm-mounted Mantis blades, a “tech shotgun” that could penetrate walls, and a “ricochet targeting system” that made shooting around corners easy. There’s a stealthier side to combat, too. You can sneak up and disable an enemy, allowing you to hack into them and breach the local area network, opening doors and wreaking havoc. 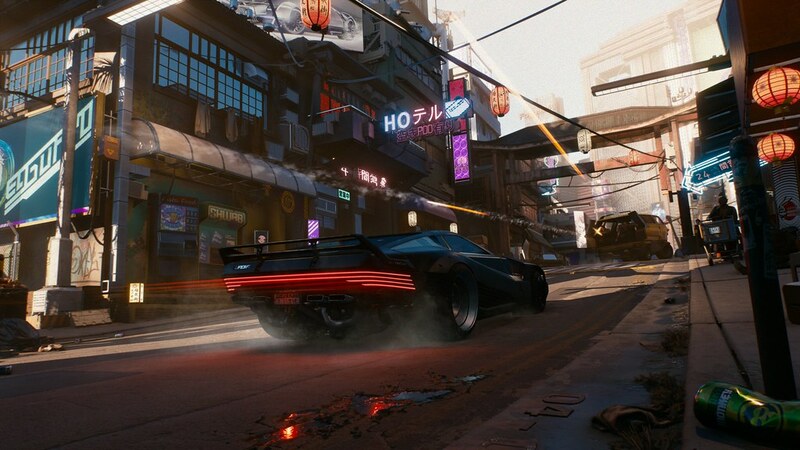 A few other interesting odds and ends: the inspection system that allows you to pore over a 3D model of an object to look for clues; the fluid character class system that allows you to tailor your play style via cybermodifications and drugs; the characters and concepts that bring Night City to life. But I have to stop somewhere. Let me know if you have any questions in the comments below! And we’ll look forward to having lots more to say about Cyberpunk 2077 in the months ahead. I used to play pen and paper cyber punk all the time and I loved it. I cannot wait for this game!!!!! Really impressed by the style and tone of the trailer. Makes me think this will be an interesting open world game to play. Looking forward to it. I have been ready to move into Night City from the day the first trailer launched. My expectations are always in check many times its my imagination and personal goals in a game that makes it for me personally. 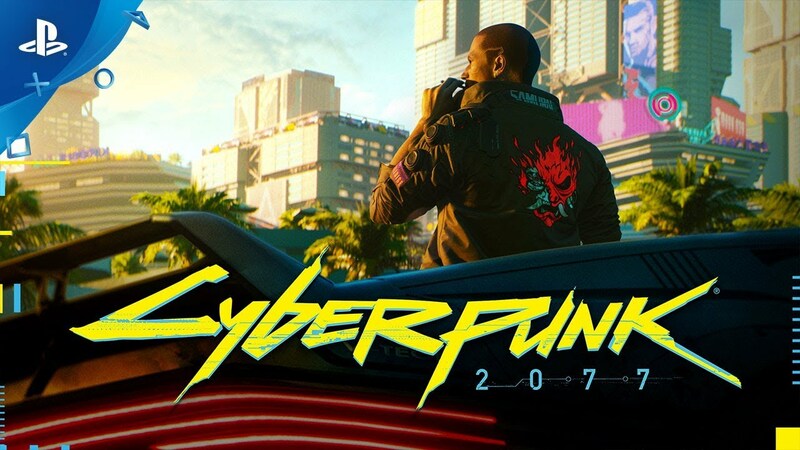 Mike Pondsmith interviews about Cyberpunk 2020 and 2077 boost my desire to play Cyberpunk 2077. I am very happy its coming to PS4 my new platform of choice over PC. Enjoy the locked 30 FPS, inferior controls, and lesser visuals? I am interested in the new products coming out, but the rating doesn’t appeal to me at all on the modern console. I sure hope they don’t use the same map and quest marker system that made the Witcher games unplayable. I had to quit playing Witcher 2 because the quest markers were often in the wrong place and I would end up running around in circles trying to find a key quest objective. I didn’t bother with the Witcher 3 because I heard it still had the same problems. If they fix those issues in this game I’ll definitely buy it, but I will cautiously wait and see what the player reviews have to say. That’s weird. I never had that issue, and TW3’s quest marker system was different from TW2’s. Lmfao you haven’t played Witcher 3 because of reasons that caused you problems Ina game that was released years before ? And I understand soething game breaking but mis placed quest markers ? Are you kidding me, I would roast you even more but Witcher 3 is so masterclass that all Imma say now is go get it and finish it. Glad to see PS Blog FINALLY mention this game! I found it very strange that it wasn’t included in the earlier post about the best 23 game trailers of E3 2018. Made it seem like this game was either console-exclusive or timed-exclusive to that other platform. Knowing I’ll be able to play this amazing looking game on my PS4 Pro is very reassuring! It was always going to be multiplatform. I wouldn’t be surprised if it got some exclusive content on the X1 though. CDPR has a better relationship with Microsoft than Sony. It looks so damn good. Can’t wait for it. Clickbait! This is your first look, not ours.. we still have to wait to see some gameplay. This will be the undisputed GOTY when it releases. No way I’m playing it on my Pro though. This game will be best on PC. Was really looking forward to this, but first person makes me feel sick :( hope there’s a 3rd person option either on release or soon after.